A reading project I can not resist. Florinda at the 3 R's Blog has come up with a wonderful project that is all about reading books by authors who blog. I have been doing that for some time, slowly making my way through the authors who blog at Murderati and Running with Quills just to name a couple. Go through your blog subscriptions, feed reader, or bookmarks, and note which of the blogs you read regularly are written by published authors. Check your TBR collection and/or wish list to see if you have unread books by any of those authors. Crossover with other challenges is allowed and encouraged! **The one exception to the "books on hand" rule is this: the rockin'-in-every-way Susan Helene Gottfried has offered a free e-book of her latest Demo Tapes to participants in the Blogging Authors Reading Project. To learn how to get yours, visit the post about the project. Michelle Gagnon's The Gatekeeper. She blogs over at The Kill Zone with James Scott Bell, John Ramsey Miller, John Gilstrap, Joe Moore, Kathryn Lilley, and Clare Langley Hawthorne. From the group of wonderful paranormal romance authors at Deadline Dames, I have Rachel Vincent's My Soul to Lose. She blogs along with Keri Arthur, Devon Monk, Jackie Kessler, Karen Mahoney, Lilith Saintcrow, Rinda Elliot and Toni Andrews. Kissing Sin, book #2 in the Riley Jenson Guardian series by Keri Arthur is on my wishlist and I'm sure to get it and read sometime this year as well. Ted Dekker's "Burn" and "Green"
I expect to read 100% considering the fact that I actually have them in my possession, except for three and am looking forward to reading them. How about you? Do you read follow any authors blogs and have you been reading their books. 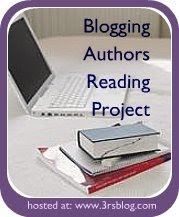 Then click over and Sign up for Florinda's Blogging Author's Reading Project. It will be fun! I'm really glad you're on board with this challenge - thanks! I really wish I could squeeze this one in! Beth Kephart has a blog, which I read regularly. I love her writing style. I like this challenge...love to read author's blogs too!! !